Over the past few years I've seen an amazing improvement in my skin and I believe that is the result from using French Pharmacy skincare brands. I love the philosophy of treating your skin with care and attention instead of using harsh, stripping ingredients that make your skin worse in the long run. With Escentual running their 1/3 off French Pharmacy Sale running during the month of June, I decided I would stock up on my essentials and throw in some new products to try at the same time. Here's what I picked up. First up is the La Roche-Posay Rosaliac Micellar Make-Up Removal Gel which has been my go to makeup remover for quite a while. A while back was looking for a makeup remover which was non-foaming and perfect for sensitive skin and it ticks all of those boxes. It removes makeup with ease and I've gone through at least 3 bottles of the stuff.so naturally I had to pick up two of these. My skin usually gets quite dry during Summer so I thought I should pick up another Bioderma Hydrabio Serum - Moisturising Concentrate. 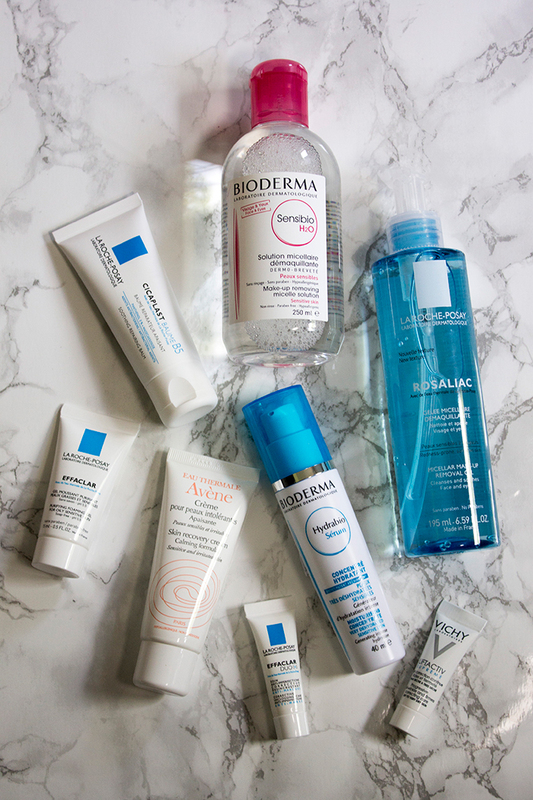 If you're not familiar with it, it's basically Bioderma's answer to Hydraluron. It's a serum containing hyaluronic acid which helps boost the performance of your moisturiser, helping your skin retain more moisture. This is probably my third bottle of the stuff and I notice a huge difference when I use it. Of course I couldn't put through an Escentual order without stocking up on the Bioderma Sensibio H2O Micelle Solution. It's the perfect eye makeup remover but I do occasionally use it to take off a full face of makeup if I'm feeling a little lazy! I'm glad it's much easier to get hold of these days and I can't see myself not repurchasing it anytime soon. Once I stocked up on my favourites, I decided to try something new with the Avene Skin Recovery Cream. Having never tried any Avene products, I was curious to see how it would perform having heard really good things about the brand. I'm also currently trying out Dermarolling for my acne scarring so I thought this would be great to use with it. If the Avene cream doesn't work, I also picked up the La Roche-Posay Cicaplast Baume B5 - Soothing Repairing Balm to see how it compares. This has been on my wishlist for quite some time and with my previous experience with La Roche-Posay products, I'm confident that it will work really well for my skin. It seems to be along the same lines as the Avene version but maybe slightly thicker so we'll see which one comes out on top! My order also came with some free samples which was a nice unexpected touch. I try to stay away from foaming products so the La Roche-Posay Effaclar Purifying Foaming Gel is probably one that I'll pass onto someone else but I'm excited to try out the Vichy Liftactiv Supreme and La Roche-Posay Effaclar Duo + samples I received. That's everything I picked up from the Escentual french pharmacy sale! I was tempted to pick up mainly products I haven't tried before but I felt that it was best to pick up things that I know work really well for me and throw in one or two new ones into the mix. The french pharmacy 1/3 off sale is running for the rest of the month of June so make sure you pick up some products while they're still on offer!